A scene at the Custer County Chief in Broken Bow, Nebraska. 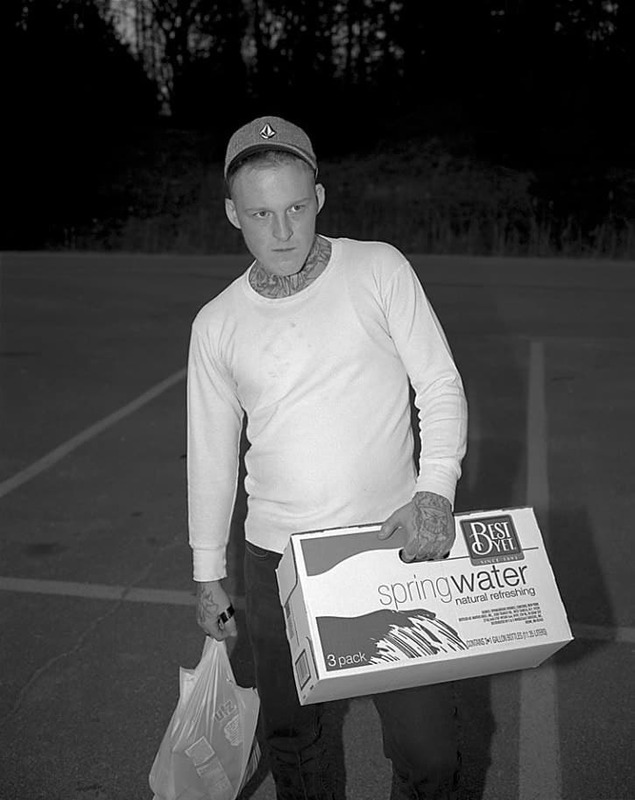 Photo by Peter Crabtree, from his "Newsprint" series. In 2015, photographer Peter Crabtree drove coast-to-coast-to-coast, documenting an institution that lies at the heart of many -- if not most -- small cities: the small-town newspaper. He came home with a portfolio full of these unique places and the characters that inhabit them. Normally, stories in our Viewfinder series are comprised of an interview with a photographer and a sample of their rural work. We’re approaching this one from a slightly different angle. 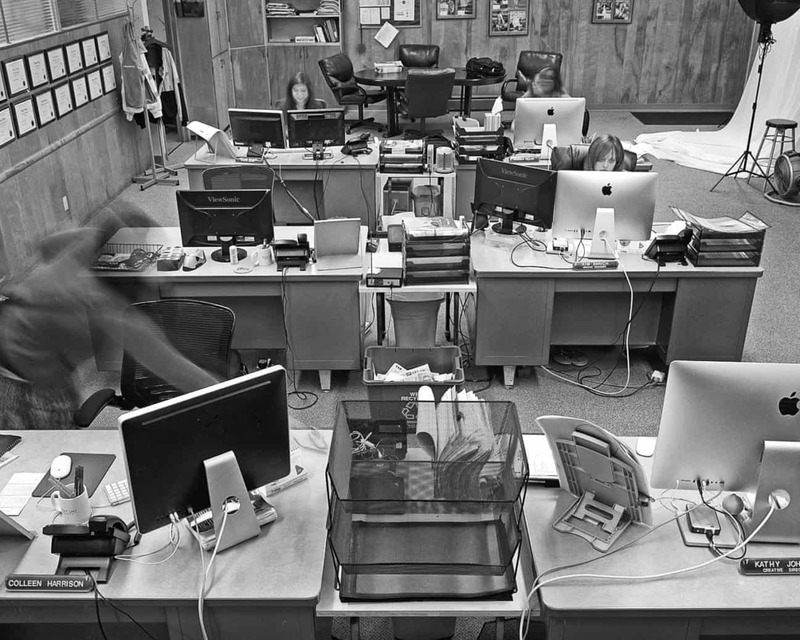 I learned about Peter Crabtree’s work when my co-worker, Tim, yelled to me across the office, “Hey, Shawn, come look at these.” On his screen were black-and-white photographs of small-town newsrooms — the cluttered desks, a news staffer taking notes with a phone cradled under her chin, inexpensive wood paneling, police scanners, a writer intently looking at a computer as if her words might pop up on her screen any moment. We scrolled through Crabtree’s photographs and fell to telling stories about our own experiences in newsrooms. The people, the equipment, and the lived-in look even the newest spaces invariably had. It turned out that I actually interned at one of the papers that Crabtree featured, the Santa Fe New Mexican, back in 2000. Though newspapers have had a rough go of it lately, there’s still plenty of print journalism in small towns. There are an estimated 7,500 papers with under 30,000 in circulation in the U.S., according to a Stanford report. I think the ones that thrive have do so because their focus is local. To some extent they provide information that residents can’t get anywhere else. That doesn’t make them invulnerable, but it does perhaps make them irreplaceable. We like these photos so much, we’re going to run some today and then use the rest of Crabtree’s collection as a recurring feature for several weeks. It’s our way of calling attention to an important small-town institution and the people who put out the news. Newsroom of the Albert Lea Tribune in Albert Lea, Minnesota. Q: Where did you grow up? Tell us a little bit about your background. I was born in West Virginia, but I was still an infant when my mother and I moved to the Bronx, where I was raised. I live in North Bennington, Vermont. It’s in the southwestern corner of the state, a short distance from the New York and Massachusetts borders. I’ve been in the area since 1979 and I’ve come to love it. Q: When and why did you first start taking pictures? I started taking photos in the early 1970s, while attending Lehman College, part of the City University of New York. Although I wasn’t fully aware of it until I began taking classes, there was a photography boom underway in the city, with galleries devoted to contemporary and historical work springing up. Seeing prints by Walker Evans and Robert Frank and Helen Levitt, among others, fed my appetite to take photos. As to why I began in the first place, it’s hard to say, but I grew up watching black and white movies and reading comic books and photography was aligned with that somehow. I also liked the idea that with photography you could work intuitively, and that the photos could be about something other than yourself, while still being deeply personal. It offered a heightened way of being in the world. Q: Tell us about the series “Newsprint.” How did it begin; how do you explain it to folks? It began with plans for a cross-country road trip in the spring of 2015 and my desire to be productive somehow. David Carr, the New York Times media critic, had died only a few months before and I had been thinking about something he wrote about the importance of family owned newspapers and how critical local beat reporters are to civic life. The piece hit home because for 30 years I had worked for small dailies in Vermont, first as a reporter, and then an editor and finally a photographer. 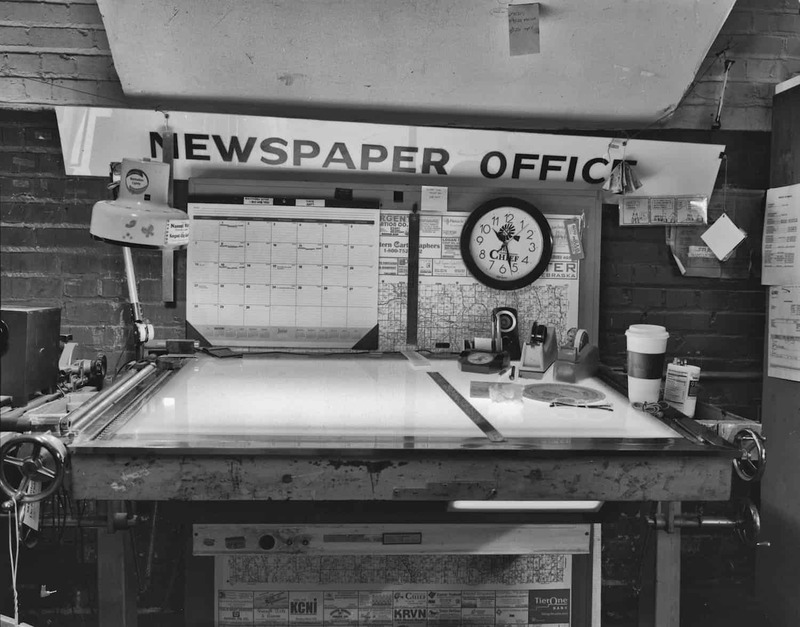 To put it mildly, I was aware of the challenges the newspaper industry faced in a digital age and I thought it would be worthwhile to document newsrooms and pressrooms and the people who worked in them during a time of change. That was how I pitched the project as I improvised my route across the U.S., sometimes sending emails to editors in advance and at other times just showing up and talking my way in. There was a practical reason for the project, too. I thought if anyone would have a hard time denying a photographer access it would be those who seek it for themselves. I also thought I’d enjoy the company of journalists on a solo road trip. The best of them are smart and funny and they don’t take themselves too seriously. Q: Tell me more about driving cross-country and visiting these papers? Do any stories stand out? Maxine Corbett of the Nicholas Chronicle in Richwood, West Virginia, was notably kind and generous. That was an instance in which I just stumbled upon her one-person bureau on Richwood’s hollowed out Main Street. At 81, she had spent decades reporting on the town and she was able to make me see it as it had once been, a thriving mining and lumber center. There were groups who stood out as well. 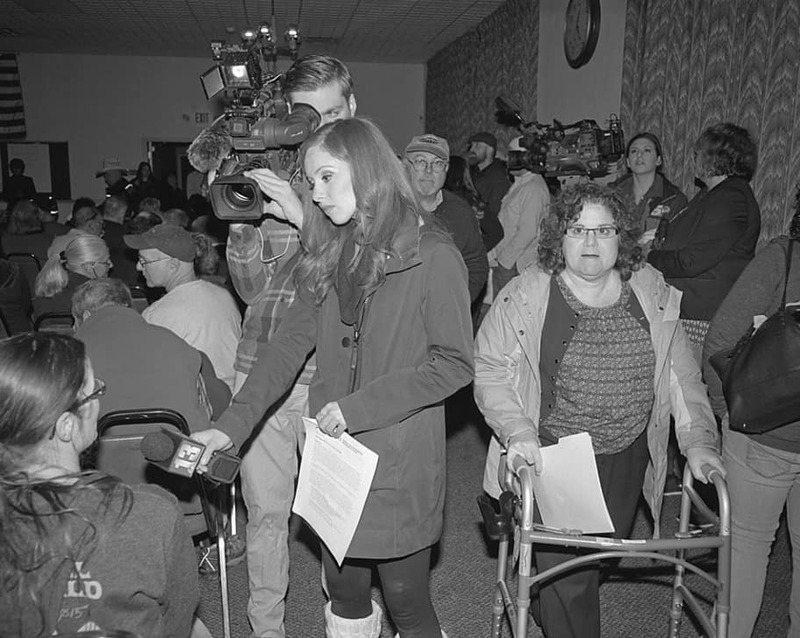 I’d walk into quiet, open-plan newsrooms — the Worthington (MN) Daily Globe and Laramie (WY) Boomerang come to mind — and stare at these strangers as they worked and they’d do their best to carry on and ignore me. It was often uncomfortable for us both. I failed to take good photos more often than not, but I was grateful to everyone for their patience and goodwill. One regret was that I had to abandon my plans to head south from West Virginia. Tornadoes forced me to dash across the Midwest and I didn’t start working again until I reached Clayton, New Mexico, a little town near the Oklahoma and Texas borders. At the Union County Leader I found they were still pasting the paper up by hand, using Exacto knives and pots of glue. It took me back to my beginnings, when we designed pages with a grease pencil and a proportion wheel. As far as meals went, I developed a taste for In-N-Out burgers, something we don’t have in the East. And in six weeks I put about 9,000 trouble-free miles on my VW wagon. The only mishap occurred while I was camping in Joshua Tree National Park. I was distracted somehow and ran over my camera bag, putting a Leica M6 out of service and banging up a Mamiya 7II. Q: What inspires you and fires you up to shoot a project (or just to get out and work)? Working on projects is comparatively new to me. For the longest time I would simply photograph whatever caught my eye and hope that in the editing process I could find a common thread. But with the Newsprint project I made a conscious decision about subject matter. Clearly, there was an emotional connection there. And that’s true of my current project. Last year the nearby village of Hoosick Falls, New York, discovered that its municipal water supply had been contaminated by perfluorooctanoic acid, or PFOA, a suspected carcinogen. Then the chemical started showing up in my neighbors’ wells here in North Bennington, as well as Pownal, Vt., and Petersburgh, NY So I’ve been taking portraits of those affected by the crisis and documenting the states’ response. The work can be found on the home page of my website, petercrabtreephoto.com. 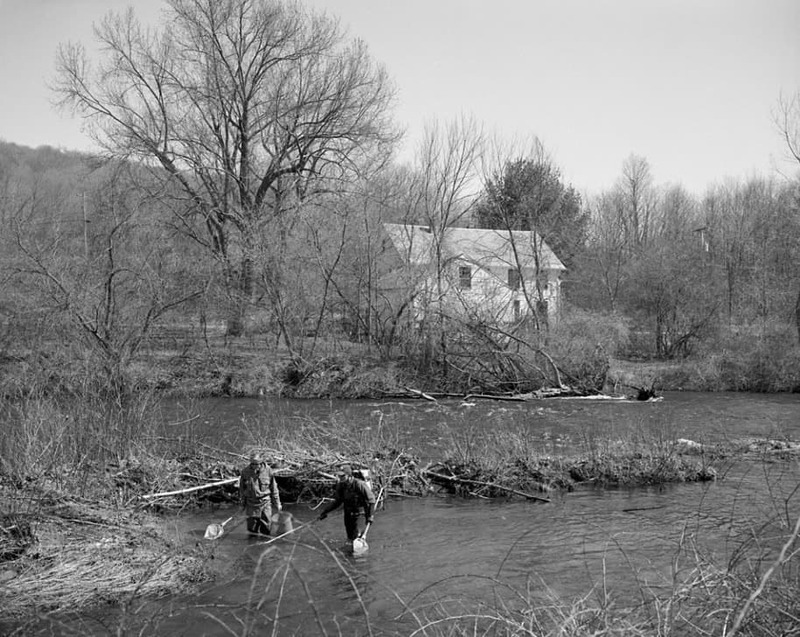 From Peter’s project on perfluorooctanoic acid contamination in Hoosick Falls, New York. Q How much time have you spent working on that PFOA project? Is that all medium format? If yes, why the choice to stick with film? I’ve been working on that project off and on for nine months now. It’s been my primary focus, although I continue to devote time to art documentation jobs and the occasional travel writing assignment. Like the Newsprint project those PFOA photos are medium format, which is another thing that’s new to me. I began my career shooting 35 mm film and then made the transition to digital DSLRs, which made it easy to take hundreds of photos in the course of a day, all of which would have to be edited at some point. The Mamiya 7II and RZ67 cameras I’m using now give me only 10 exposures for each roll of 120 mm film. That’s forced me to slow down and choose my subjects and exposures more judiciously. I also like the formal proportion of their 6×7 cm frames in comparison to the 2:3 aspect ratio of 35 mm. Q: Are you especially drawn to working in small towns? I’ll work wherever they’ll have me, but at this point in my life, I’ve spent more time in the country than the city, although I’ll always be considered a flatlander by native Vermonters. I don’t photograph nature, per se, but I need a connection to the natural world. I’d be much poorer without it. That said, I love cities, too. Usually in brief spurts. I look to the example of the late poet and novelist Jim Harrison on how to navigate between the two.